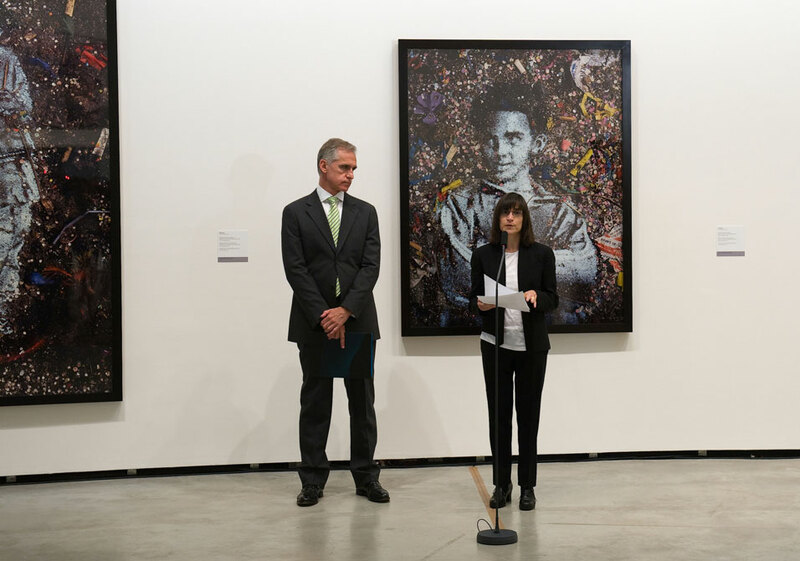 Juan Ignacio Vidarte, General Director of the Guggenheim Museum Bilbao and Nancy Spector, chief curator of the Solomon R. Guggenheim Foundation. BILBAO.- The Guggenheim Museum Bilbao unveils From Private to Public: Collections at the Guggenheim, an exhibition that explores the origins of the permanent collection of the Solomon R. Guggenheim Foundation through its varied private collections, which are crucial for understanding its nature and evolution. In the year which marks the 50th anniversary of the opening of the Guggenheim Museums Frank Lloyd Wright building in New York, the Guggenheim Museum Bilbao pays tribute to this milestone with this presentation as well as Frank Lloyd Wright: From Within Outward, which is devoted to Wrights celebrated career as an architect and opens in October 2009. From Private to Public , organized by the Solomon R. Guggenheim Foundation, features around 100 works reflecting on the fascinating parallels between a diverse group of visionaries who collected the art of tomorrow over the course of the twentieth century. This exhibition, co-curated by Tracey Bashkoff, Associate Curator for Collections and Exhibitions, and Megan Fontanella, Assistant Curator, offers a unique glimpse into the avant-gardes of the late nineteenth and twentieth centuries through masterpieces by artists such as Vincent van Gogh, Paul Cézanne, Pablo Picasso, Juan Gris, Vasily Kandinsky, Marc Chagall, Paul Klee, Alexander Calder, and Jackson Pollock, as well as art at the turn of the millennium with works by Sophie Calle, Jac Leirner, Hiroshi Sugimoto, and Jane and Louise Wilson, among others. The exhibition provides visitors with an interesting vantage point on the origins of modern art and the transition to the twenty-first century. The three classical galleries on the museums third floor house a tour through six of the seven collections represented in this exhibition those of Solomon R. Guggenheim, Justin K. Thannhauser, Hilla Rebay, Katherine S. Dreier, Peggy Guggenheim and Karl Nierendorf through a careful selection of paintings and sculptures from the most representative artistic movements of the nineteenth and first half of the twentieth centuries. The exhibition is rounded out with around 30 works rendered in different media (video, conceptual art, photography, etc.) since the 1990s from the Bohen Foundation gift, donated to the Solomon R. Guggenheim Foundation in 2001. The metamorphosis from private collection to public museum is an extraordinary one. For the Solomon R. Guggenheim Museum this occurred in 1937, when Solomon R. Guggenheim (18611949) established a foundation with the goal of opening a museum publicly exhibit and preserve his holdings of nonobjective art. Solomon R. Guggenheim was born into a Jewish family of Swiss origins that immigrated to the United States to improve their economic prospects. His father, Meyer Guggenheim, amassed a vast fortune in copper and silver mining, building a veritable economic empire that six of his eleven children would help to consolidate. One of them, Solomon, an industrialist married to Irene Rothschild, began to take an interest in the art world in the 1890s and collect work by the old masters, including American landscapes, the French Barbizon School and primitive art from the mid-1890s. Nonetheless, his collecting priorities shifted radically in 1927 when he was 66 years old and his wife, Irene, fatefully commissioned the young German artist Hilla Rebay to paint Guggenheims portrait. Hilla Rebay (18901967), an artist with Prussian roots who lived and worked all over Europe before moving to New York in 1927, changed Guggenheims interests in art to such an extent that she actually transformed the nature of his collection. She gradually introduced Guggenheim to nonobjective art, a method of abstraction that aspired to spiritual and utopian goals. Thanks to Rebay, in 1930 Solomon and Irene Guggenheim met Russian-born artist Vassily Kandinsky at his Dessau studio, ultimately leading to the acquisition of more than 150 of his works. The abstract paintings of German artist Rudolf Bauer, an intimate acquaintance of Rebay since her early career in Berlin, were likewise collected in depth. Under Rebays tutelage, Guggenheim invested in many artworks thought to be radical in his time. The risks he was able to take as a private collector ultimately benefited the foundation to which he generously gave his name and legacy. Despite his penchant for abstraction, Guggenheim also actively sought work that did not fit the mold of nonobjectivity and patronized modern masters like Marc Chagall, Robert Delaunay, Albert Gleizes, and Pablo Picasso. Guggenheim and Rebays ambitions for their foundation were realized in 1939 with the opening of the Museum of Non-Objective Painting located on New Yorks East 54th Street. Hilla Rebay was appointed the museums first director and curator, a position that she held until 1952. In 1949, the museum was moved to 1071 Fifth Avenue, and the Frank Lloyd Wright building, the current site of the Guggenheim Museum in New York, was officially unveiled ten years later, in 1959. The extraordinary collaboration between artists, Solomon R. Guggenheim and Hilla Rebay gave rise to one of the most spectacular early twentieth century collections of the modern movement. The origin of the Guggenheim Collection is essentially the story of varied private collections brought together under one roof: Solomon R. Guggenheims own collection; the inventory of German Expressionist and early Abstract Expressionist art assembled by Karl Nierendorf (18891947); Peggy Guggenheims (18981979) collection of abstract and Surrealist painting and sculpture; the array of Impressionist, Post-Impressionist, and early modern masterpieces assembled by Justin K. Thannhauser (18921976); and several important works from the estates of Hilla Rebay (18901967) and Katherine S. Dreier (18771952), both of whom were influential in promoting modern art in the United States. Presenting masterpieces from these core collections, From Private to Public explores the intriguing parallels between a diverse group of art enthusiasts whose lives intersected over several decades. Though their collecting priorities and personal tastes differed, many common threads can be found among these six modern collections. For instance, all contain the work of both Paul Klee and Kandinsky. In fact, it was Klee who convinced Nierendorforiginally a bankerto enter the art trade in his native Cologne after World War I. Several works have a shared provenance, or ownership history, as well. Franz Marcs Yellow Cow (1911) and Delaunays The City (1911) appeared in the first Blue Rider group exhibition at the Moderne Galerie, operated by Thannhausers father Heinrich, in December of 1911, only to be later acquired by the Guggenheim Foundation. Likewise, Nierendorfs New York gallery sold many pictures to Hilla Rebay , Solomon R. Guggenheim, and Peggy Guggenheim in the 1940s, before the Guggenheim Foundation purchased his entire estate and gallery stock in 1948. From Nierendorf to Rebay, these influential art patrons brought to light some of the most significant artists of the twentieth century, and their vision and connoisseurship helped to define the scope of the Guggenheim Collection. Career gallerist Thannhauser, who mounted the first major Picasso retrospective in 1913, provided crucial early support to artists not yet widely known or respected. Peggy Guggenheims roster at her Art of This Century museum-gallery, open from 1942 to 1947, included such future leaders of the New York school as Jackson Pollock and William Baziotes. Moreover, the Société Anonyme, founded by Katherine S. Dreier in 1920 along with artists Marcel Duchamp and Man Ray, was the first collection in the United States to be called a Museum of Modern Art, despite the fact that it never had a permanent exhibition venue of its own. Each of these extraordinary personal collections has been incorporated over the years into one comprehensive array of late-nineteenth- and twentieth-century avant-garde art at the Guggenheim Museum. True to Solomon R. Guggenheims original mission to promote the art of tomorrow, the Foundation he established in 1937 is committed to increasing its holdings of contemporary art today. The Foundation acts as a catalyst for artistic production through an ambitious and unique program of art commissions at the Deutsche Guggenheim Berlin, and through such awards for living artists as the biannual Hugo Boss Prize. It also continues to acquire artworks by both established and young artists working in a diversity of media. The result is a richly layered, international collection of some 7.000 works that has nearly doubled in size since 1990 thanks to new acquisitions, the majority of them dating from 1970 or later. In conjunction with a presentation of the museums collections of early modern art from Impressionism to Surrealism, a selection of contemporary holdings from the Bohen Foundations gift will also be on view. The Bohen Foundation, a private charitable organization under the leadership of Frederick B. Henry since 1984, commissions new works of art with an emphasis on film, video, and new media. Started by Henrys grandfather, Fred Bohen, in 1958 in Iowa (United States), the Bohen Foundation was originally a traditional, grantmaking family foundation that supported local community causes. Under Henry, it became exclusively dedicated to sponsoring contemporary art, with its resources reaching nationally through a unique system of patronage through which the Bohen Foundation commissions art and then donates the commissions to major institutions. In 2001, the Bohen Foundation generously gave the Guggenheim Foundation its entire collection. Complete with 277 works by 46 artists such as Pierre Huyghe, Sophie Calle, and Jac Leirner, the Bohen Foundation gift immeasurably enriched and expanded the museums collection of modern and contemporary art, particularly in the area of new media works and photography. At the Guggenheim Museum Bilbao, a selection of Bohen photography, video, painting, and installation art from the 1990s and turn of the millennium will be on view. Meadows Museum Presents "Diego Rivera: The Cubist Portraits, 1913-1817"